Stand-up paddle boarding has become a very popular recreational activity and sport in areas with active beach activity, like on the Hawaiian island of Maui. It gives you the thrill of surfing while not requiring you to be an expert surfer. In fact, in Maui, there is an excellent stand-up paddle board school run by Maria Souza. So that leads us to the questions, what is stand-up paddle boarding and what is the difference between an inflatable stand-up paddle board and a traditional fiberglass paddle board? Stand-up paddle board surfing, SUP for short, is a combination of traditional surfing and paddle boarding. Tahiti is where the surf sport traces its beginnings, but with Hawaii standing as one of the best surfing locations in the world, its heritage runs deep in the Aloha State, particularly the beaches of Maui. The board itself is similar to a traditional surfboard. They are anywhere from 9-12 feet in length and have padded decks, up to three fins as well as concave hulls. Of course, they also come with a paddle that varies in size but is six to nine inches taller than the user. To learn how to stand-up paddle board requires some teaching, Maria Souza’s school is an option when in and around Maui, but you don’t have to wait to catch a wave. Rather, you need to learn to stand atop the board and balance while paddling through the water. So what are the differences between the best inflatable paddle boards and traditional fiberglass paddle boards? Advantages of inflatable paddle boards are price, portability (especially travel), features, durability, paddling positions, and stability. Let’s look at the cost. An inflatable paddle board can cost anywhere from $250-600 and up. Compare that to the fiberglass models starting point at close to $700, and we have a clear winner. The best inflatable paddle boards also come with many features that aren’t very practical with the heavier fiberglass varieties. Things like storage compartments, backrests and even fishing rod holders. Not to mention the inflatable boards are more easy to customize. Since the inflatable paddle boards are made with plastic materials, this is a more durable material than fiberglass. Since the inflatable versions are more easy to add contours and even seats and backrests, this makes their paddling positions more advantageous. Stability is easier on the inflatables mainly because they have higher sides than the thinner fiberglass paddle boards. Fiberglass boards tend to be easier for those who enjoy more speed and tracking and like better maneuverability and longer boards. 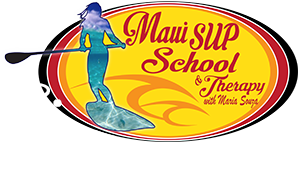 When in Maui and you want to learn how to stand-up paddle board, get your best Maui inflatable paddle board and let Maria Souza teach you how. Maria is an elite ocean athlete, and her school can teach you how to use an inflatable stand-up paddle board expertly and in no time at all. Seek out her contact information on this page and get in touch with one of her friendly associates for any questions or to book an adventure today.